This recipe is a crowd pleaser and is perfect for lunch or dinner. 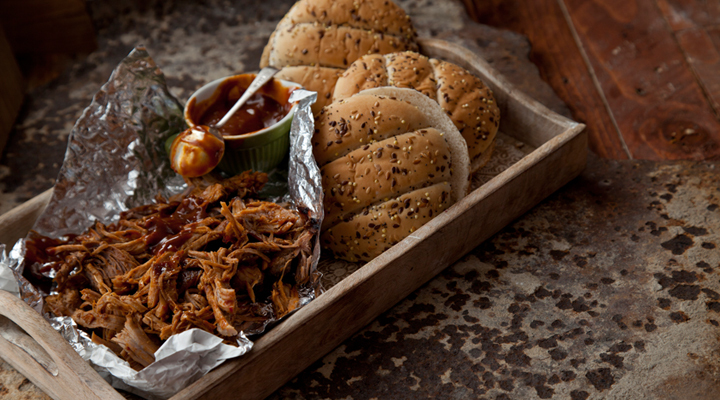 Place the pork shoulder on a baking tray. In a bowl, combine the 3 tablespoons of brown sugar with the salt, thyme, cayenne pepper, black pepper and the zest of 2 lemons. Rub the seasoning evenly over the pork and cover with cling film. Marinate in the fridge for at least 4 hours or overnight. Preheat the oven to 150oC/gas mark 2. Let the pork come back to room temperature for 30 minutes, then cook in the oven for 3 to 4 hours, until tender and the internal temperature reaches 70oC. Combine the white wine vinegar, cider vinegar, the remaining 2 tsp of brown sugar, chilli flakes and the zest and juice of 1 lemon in a small saucepan. Bring to the boil, then remove from the heat. Baste the pork with this sauce fairly frequently as it cooks in the oven. When the pork is done, use a knife and fork or two forks to pull the meat apart into small sliced or chunks. Toss with the barbecue sauce and divide between the buttered baps with some salad leaves and tomato slices.